Looking at your own life, what do you to do experience these feelings? You may choose to exercise, do creative projects, develop new skills, explore ideas, solve problems, tackle challenges, pass on knowledge or whatever. Some people experience other feelings. They feel strained in their life or work. Sometimes they numb this feeling, but it can lead to them paying a price. In some cases the strain becomes so great that it requires the equivalent of surgery. The person’s system breaks down and they need major help to recover their health. Describe a specific situation in the past when you did satisfying work that was stimulating and stretching rather than straining or requiring surgery. People love to do work that is satisfying. They may do this when playing music, tending their garden, cooking nourishing food, renovating a house or whatever. They then go through the process of absorption, adventure and achievement. People sometimes like to go further and do things that are stimulating and stretching. They then expand their horizons, expand their skills and expand the repertoire of tools that they can use in the future. Sometimes people who do this go into a state of flow. They may be tackling a stimulating challenge, solving a problem, performing in a choir, working to meet a deadline or whatever. They may then flow, focus, finish and, as a by-product, get a sense of fulfilment. The feeling afterwards can be one of positive exhaustion or a sense of peace. They have pursued their purpose, followed their chosen principles and achieved their picture of success. It is then time to rest before finding the next sense of purpose. Looking at your own life, what are the activities that you find stimulating and stretching? What do you gain from doing these things? You may feel alive, develop their ideas or gain a sense of accomplishment. If you wish, try tackling the exercise on this theme. This invites you to describe these activities and what you get from doing them. These can be activities in your personal or professional life. People can put themselves into situations where they strain themselves physically or psychologically. Sometimes it can be hard to recognise when they cross over the line between stretching and straining. How to recognise the difference? One approach is to look for symptoms. These can include feeling out of control, persistent tiredness or other physical or psychological symptoms. They may experience headaches, acne or a sense of meaninglessness. Sometimes it can be hard to recognise when you move into doing work that becomes debilitating. Some organisations aim to attract people who want to do satisfying work and, for the first few years, things go well. People who rise in the organisation, however, may find themselves moving away from the things they find satisfying. They spend their time in meetings, move into managerial roles and move closer to leadership teams that may be dysfunctional. They then spend most of their time trying to manage their bosses and act as air cover for their people. At the moment people are straining every muscle to keep jumping 2 metres. But let’s move the bar up to 3 metres. We will then get a lot of the people to jump 2.5 metres. People sometimes balk at first, but many then get on with trying to reach the new targets. They put in more hours, get less sleep and strive to achieve the aims. Sometimes this works for a while, but there are downsides. People perform best over the long term by aiming for stimulating goals rather than surgery goals. Going for stimulating goals can create breakthroughs. Going for surgery goals can create breakdowns. Looking back, can you recall a time when you aimed for what might have been a surgery goal? This may have involved pursuing a work goal at the cost of your health, aiming to please everybody or striving to achieve an unrealistic target. What happened as a result of striving for the surgery goal? You may have managed okay. On the other hand, you or your loved ones may have paid a price. What lessons did you learn from working towards the surgery goal? Looking ahead, can you think of a situation in which you want to do something that is stimulating and stretching? You may want to explore a particular topic, write a book, master a skill, tackle a specific challenge or whatever. Bearing this in mind, it be useful to explore the following themes. What is the activity I want to pursue? 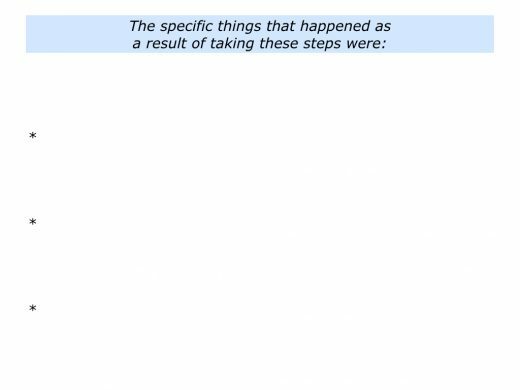 What are the real results I want to achieve? What are the reasons why I want to pursue the activity? What will be the benefits for me or other people? What is the picture of success? How can I do my best to achieve the goal? What are the key strategies I can follow to give myself the greatest chance of success? How can I translate these into concrete action plans? If appropriate, how can I get the required support? When do I want to begin? How can I get some early wins? How can I follow my successful working style? How can I set achievable goals each day and get a sense of success? What else can I do to do my best to achieve the picture of success? Imagine that you have set a specific goal that is stimulating and stretching. How can you pursue your chosen path? One approach is to follow your chosen rhythm. This involves organising your time in blocks so you can concentrate fully. It also involves making the best use of your prime times. These are the times of the day when you have most energy. 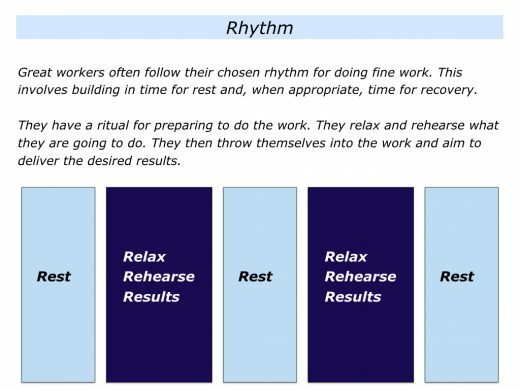 Great workers create time for rest and, when appropriate, for recovery. They often have a ritual for preparing before doing the work. They relax and rehearse what they are going to do. They then immerse themselves fully in the task and aim to achieve the desired results. Imagine that you are setting out on pursuing your chosen activity. How can you stretch yourself? How can you recognise if you are going beyond stretching into straining? What will be the benefits of stretching yourself in a healthy way? Describe a specific situation in the future when you may want to do satisfying work that is stimulating and stretching rather than straining or requiring surgery. 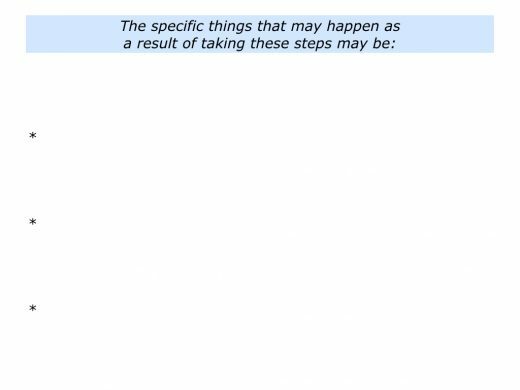 Describe the specific things you can do to take steps.